The purpose of this section is to show you how to set up your employees wages, deductions, accruals and other information. Go to the main Setup menu and select Employee Setup, and then select the employee you wish to enter payroll information for. Check all the boxes that apply to this employee. If they are a regular employee that will be included in payroll, check the box to indicate that. If you wish to track Vacation, Sick, and Holiday time, check the box for that tab to appear on the employee screen. If your company allows advances, check that box. Note: you must have the Payroll Module turned on for these checkboxes to appear. Select the Pay Frequency for this employee, such as weekly, bi-weekly, monthly and so on. Select the employee type, hourly or salary. Select the pay frequency for this employee. Select the Employee Type for this employee. Select the Marital Status for this employee. If this is an hourly employee, enter in the hourly rates for this employee (straight time, overtime, etc). If this is a salary employee, enter in the rate per pay period and the annual salary rate. If the Assumed hours worked per year is different than 2,080, check the OV box and enter the desired number. Most users will calculate vacation and sick time earned based on assumed hours worked for salary employees and actual hours worked for hourly employees. There is also an option to calculate these based on assumed hours for hourly employees. 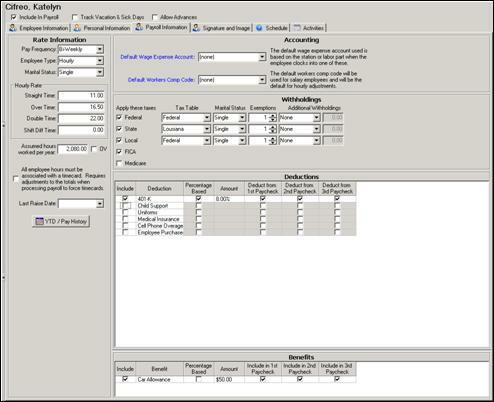 To enable this option, go to Payroll Setup>Options. If this employee's hours must be associated with a time card, check the box to indicate that. Enter the date of the employee's last raise, if applicable. If you wish to view an employee's pay history, click the YTD/Pay History button. You can select the date range to display. The data on these screens is read only; you will not be able to edit the employee's pay history here. Select the Default Wage Expense Account to be used for this employee. Select the Default Workers Comp Code to be used for this employee. Check the boxes for all applicable taxes and select the appropriate tax tables to use for this employee. Enter the marital status and the number of exemptions the employee is claiming. Enter any additional amount the employee wants deducted either as a dollar amount or a percentage. Note: if the employee wishes to use a set amount for tax withholdings instead of the tax table, simply choose “None” in the Federal Tax Table field, then select Fixed Amount under Additional Withholdings and enter the amount in the next field. This method can be used for any of the tax withholding taxes. Check the boxes for any additional deductions that apply such as 401K or Medical Insurance, and enter the dollar amount or percentage to deduct. 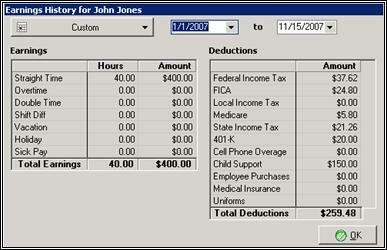 Select which pay period(s) each deduction will be taken from. If you wish to track vacation and sick time, check all the options that apply to the selected employee to enable them. Enter the GL account number to post the expense to. If you want to accrue Vacation and/or Sick Time in the GL, check the applicable box and enter the GL account to post the accrual to. Enter the number of hours earned per year. 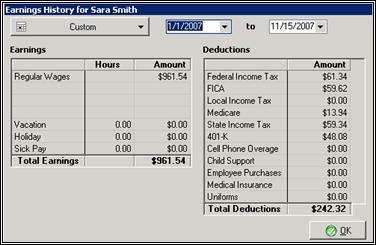 If overtime hours are to be included in calculation, check the box “Use Overtime Hours as well”. The system will track hours earned to date. You can also view the history of any time taken or hide this section. The system will track and keep a record of all employee advance repayments. The Current Advance Balance will display here, if applicable. Enter the GL account to post the receivable to. The system will keep track of the last repayment and advance dates and display those here. In the Repayment Plan section, enter the amount to deduct per pay period. The system will calculate the Estimated Payoff Date. You can view the Advance Payment History by date range or hide the advance history.